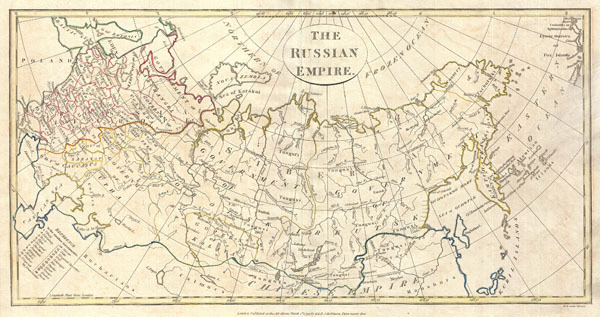 A fine 1799 map of the Russian Empire by the English mapmaker Clement Cruttwell. Covers the entire region and makes note of the many regional governments, or oblasts, as they were then known. These include the governments of Archangel, Vologda, Upha, Caucasus, and Saratov in the west. The most notable, however, are the Governements of Tobolsk and Irkutsk in central Russia. Tobolsk is the historic capital of Siberia, and is now part of current day Tyumen Oblast. After administrative division of the territory, Tobolsk remained the seat of the Governor-General of Western Siberia until the seat was moved to Omsk in the 1820s or 1830s. Bowing to the city's authority, many Siberian towns, including Omsk, Tyumen, and Tomsk, had their original arms display the Tobolsk insignia. Irkutsk is currently the largest city in Siberia and is presently the administrative center of the Irkutsk Oblast. In 1760 the Siberian Road was built connecting Irkutsk to Moscow, and it was at this point the city flourished economically, becoming a major trading hub. Crutwell also includes a reference chart to smaller governments in the lower-right quadrant. Outline color and fine copper plate engraving in the minimalist English style prevalent in the late 18th and early 19th centuries. Mountains and topographical other detail shown by profile. Drawn by Clement Cruttwell and published in the 1799 Atlas to Cruttwell's Gazetteer.